I remember driving past Superdawg on one of my many high school excursions to the city and thinking that it was the greatest place on Earth. Superdawg started as a drive-in in the late '40s owned by Maurie and Flaurie Berman. Topped by two large girl and boy hot dogs, Superdawg has outlasted all other Chicago car hops and carved out its own piece of Chicago's hot dog empire. The atmosphere of this place is perfect for a lunchtime romp. Seating is restricted to a room off of the kitchen or your own car, where car hops bring your food to you. The food at Superdawg is typical American drive-in food, including the Superburger, Superfish, Grilled Cheese (one of the few dishes without a "super" name) and, of course, the Superdawg. The Superdawg is this restaurant's shining achievement. The Superdawg is a pure beef hot dog hidden underneath a pile of onions, radioactive green piccalilli, yellow mustard, a dill pickle and sport peppers. When you first open that red box, it's hard to discern what to do with it. Hidden beneath a pile of crinkle-cut fries is your hot dog. It's a complete meal in a box, but where to start? 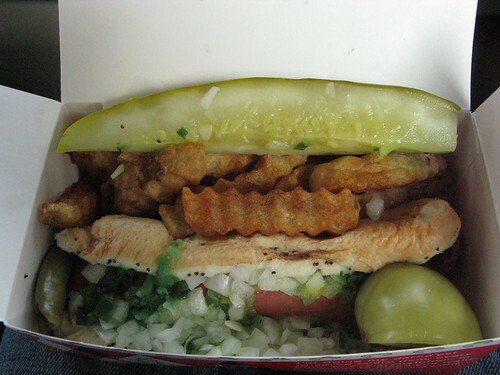 The franchise uses their own special brand of hot dogs (called the Superdawg, duh) as the basis of this "meal on a bun." Though the Superdawg doesn't have the snap that a Vienna Red Hot would have, it's still a tasty treat. The Superdawg is a more tender hot dog, and because it's all beef it still offers that signature Chicago taste with its retro twist. Normally a red hot or a kosher frank would offer something a bit more to the overall flavor of a hot dog when combined with its toppings. On a Superdawg, that subtle beefy and almost buttery taste complements its toppings instead of masking them. A Chicago hot dog is an intimidating dish because of its massive heap of condiments and the Superdawg isn't any different. It omits the sweet taste of freshly cut tomatoes and salty bite of celery salt, but since the hot dog is a less intense sausage this actually helps the overall taste. It's a mouthful of relish and onions with the pickle acting as a sealant for the dog. The sport peppers add that blast of heat throughout. The flavor is pretty mild compared to the pickled pop other restaurants have to offer but the Superdawg is a nice introduction to what a Chicago dog should be -- full of toppings with a plump all-beef dog underneath. Usually I like the salty pickled taste of a standard Chicago dog, but Superdawg's version is just the right taste for an afternoon meal. It's a dish that won't knock the wind out of you but still satisfies your craving. The Whoopskidawg is wholly different from your typical Chicago-style dog. The link itself is described on the Superdawg menu as "Romanian, Hungarian, Polish sausage" and is smokier and spicier than a hot dog, and it's served on a "Whoopskiroll" -- basically an onion roll for sausages -- with well-grilled onions, a dill pickle spear and "special sauce." 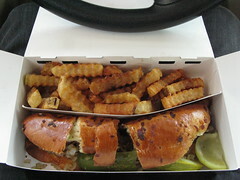 It comes in a larger Superdawg box with the customary crinkle-cut fries and pickled green tomato. It is bigger than a standard hot dog, but I don't think it's so big as to require cutting in half, which Superdawg does for you in the box. I wouldn't have expected barbecue sauce on a sausage, but that's basically what the special sauce is. And it works well with the flavors of the Whoopskidawg, roll and onions. The pickle spear is the odd man out here, and I set it aside to eat as a chaser -- an old-school waitress once told me pickles aid in digestion. Overall, it's a great sandwich: I'd eat this before I went with one of those bacon western burgers the fast food chains come out with every so often. Superdawg's fries pair well with their hot dogs, but it's their onion chips that make a better side to their dish. Instead of traditional onion rings, Superdawg slices strips of onions and deep fries them. The result is a super salty side that adds a different taste to the mild Superdawg. 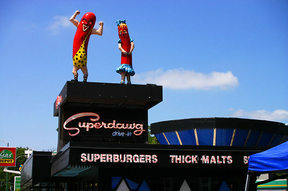 Drink-wise, Superdawg offers the regular affair of soft drinks and shakes. The Supersoda is Superdawg's traditional take on the fountain drink and is a bit too intense to accompany a whole meal, but a good dessert to split if you're coming with a guest. However their pineapple shake, with nice chunks of real pineapple, and their blackkows, which is basically a root beer float, are recommended for the patron with a sweet tooth. The Superdawg is not the most intense Chicago dog out there, but it's a great start for tourist and hot dog newbies alike and a good stand-by for hot dog enthusiasts. Where else can you get the experience Superdawg offers? Superdawg is quite a trek using the CTA (I would recommend taking the blue line to Jefferson Park and taking the 56A to Devon) but an easy 20 minute drive for those with a car. Look for those two hot dogs on the roof, and you'll know you're there. I find it hard to go to Superdawg simply because I can't justify paying $6.75 for a hot dog. Wow, is it really $6.75 for a hot dog there? That's pretty expensive considering I know I corner place that sells 2 hot dogs, fries and a coke for under $5. Hot dogs at Superdawg are $4.75 I believe. I never pay more than $15 for a meal there, and that's when I'm stocking up on Supersodas and other goodies. A Superdawg is $4.95 plus tax and it comes with fries. I know that because I tend to eat most of my hot dogs there. Nice try Mark.